Page five includes mention of Roy Bates, the former owner of Radio Essex who had recently occupied Roughs Tower, the only one of the Thames anti-aircraft forts to be absolutely definitely outside the three mile limit. He had won possession after battling with men working for Radio Caroline who had plans to use it as a supply base for the Mi Amigo. Stevi Merike and Spangles Muldoon are mentioned again, and we have the first reference to Roger Day. The Speakeasy, Bag O'Nails and Electric Garden were fashionable London clubs of the time. The same names were given to cabins on the Mi Amigo. “Frinton Flashers” were the people on the coast who flashed their car headlights at the ship, normally during Johnnie Walker's evening show. Andy Archer explains the reference to Harry the Mouse: “He was a Dutch crew member. He often used to spend hours in the studio with disc jockeys - a bit of an anorak! On one occasion Carl engaged him in conversation on the air in which Harry used a few choice expletives! !” Bud Ballou thinks the mention of “Yapp” may refer to one of the Dutch cooks, whose name was probably spelled Jaap. Noise of generators, shocking, comparison of noise on land and ship. Aerial. Type transmitter. Lifeboat with cardboard propellor. Lifeboat drill; trip in lifeboat. Ships passing by in night. Planes buzzing. Ships on horizon. Bates - view(?) of fort in distance. What shore looks like during clear day. Description of bridge. Where some of us go for solitude. Harry the mouse. Swearing on air. Discussions. TV programmes - favourite, disliked. Cards. Monopoly game between Stevi and then Spangles. Aerial turning. Chairs in library. Description of library. Records. Frinton Flashers. Cost of cigarettes. Speakeasy & Bag O'Nails. Electric Garden. Rivalries. News studio, description of. Breaking up on news & reasons why. Roger Day and “Carl Mitchell with the nudes”. Door to transmitter room. Reaction to Beatles “Magical Mystery tour”. House in Amsterdam - first - old lady & man. Second - description; events in; (illegible word) Jelly babies; chicken; clean up; birthday dinner. Swimming overboard. Yapp. Current. 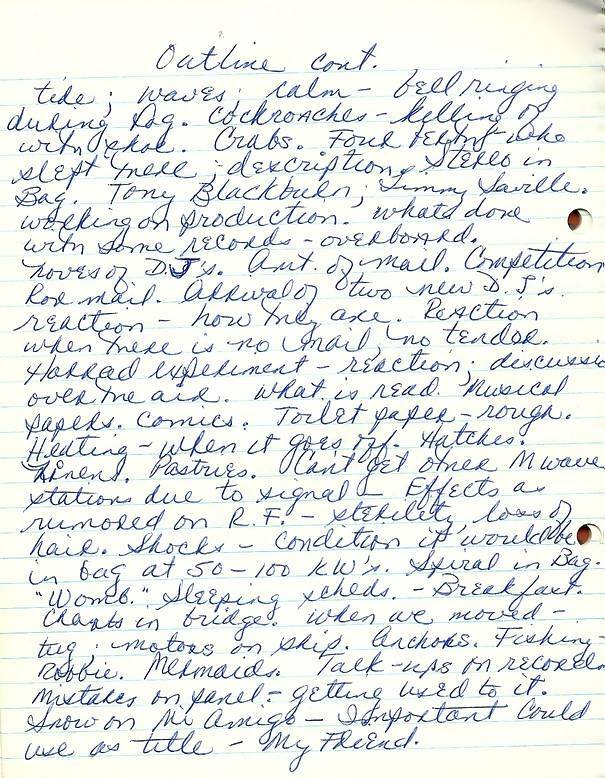 Page six of Carl's notebook talks about the quality of toilet paper used on the Mi Amigo, whether the high powered transmitter output would make the DJs sterile and, for reasons that are unclear, mermaids. The reference to “stereo in Bag” refers to the sound system rigged up in the Bag O'Nails - Carl's cabin. There is a photo of it on this page. “Spiral in Bag” refers to the aerial feeder coil that passed through the cabin. The “two new DJs” mentioned were Andy Archer and Bud Ballou. Tide; waves; calm - bell ringing during day. Cockroaches - killing of with shoe. Crabs. Four berther(?) 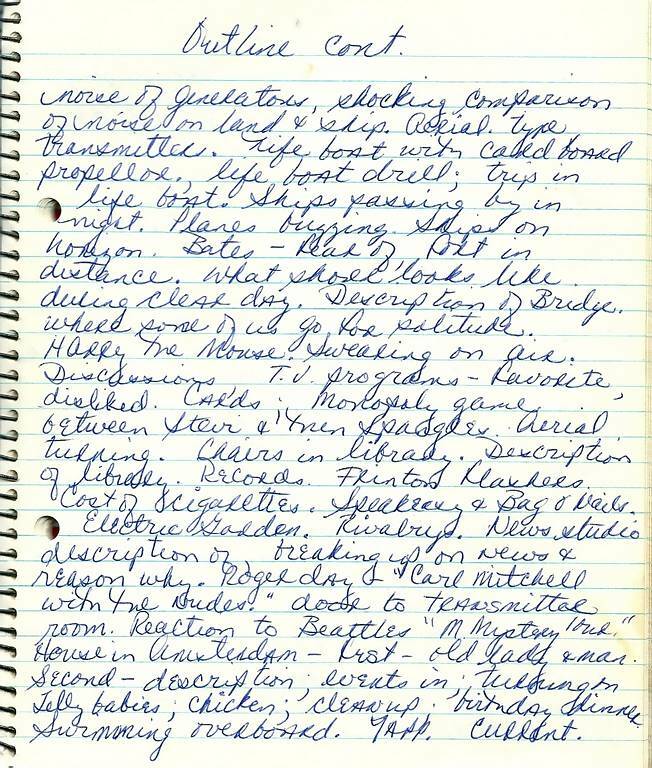 who slept there; description of stereo in Bag. Tony Blackburn; Jimmy Saville (sic). Working on production. What's done with some records - overboard. Moves of DJs. Amount of mail. Competition for mail. Arrival of two new DJs, reaction - how they are. Reaction when there is no mail, no tender. (illegible word) experiment - reaction; discussions over the air. What is read. Musical papers. Comics. Toilet paper - rough. Heating - when it goes off. Hatches. Linen. Pastries. Can't get other medium wave stations due to signal. Effects as rumoured on RF - sterility, loss of hair. Shocks - condition it would be in Bag at 50-100kWs. Spiral in Bag. “Womb”. Sleeping schedules. Breakfast. Charts in bridge. When we moved - tug. Motors on ship. Anchors. Fishing - Robbie. Mermaids. Talk-ups on records. Mistakes on panel - getting used to it. Snow on Mi Amigo - important could use as title - my friend.